1. 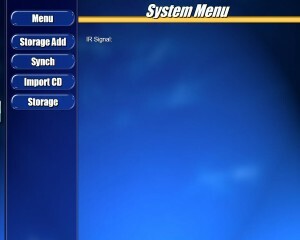 New System menu with Storage Add, Synch, Import CD, Storage buttons. 3. 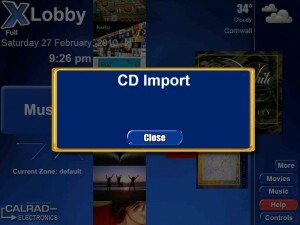 New audio cd (CDEX) importer added, screen added. 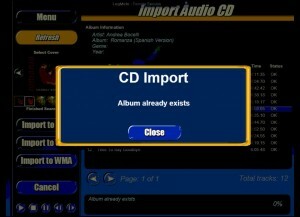 In this release we added a cd ripping interface using the CDEX Open Source Digital Audio CD Extractor. 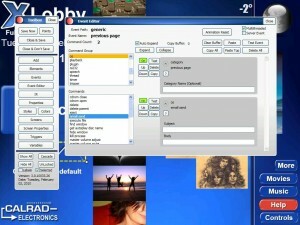 The user will not see the CDEX program screen but xLobbys interface. 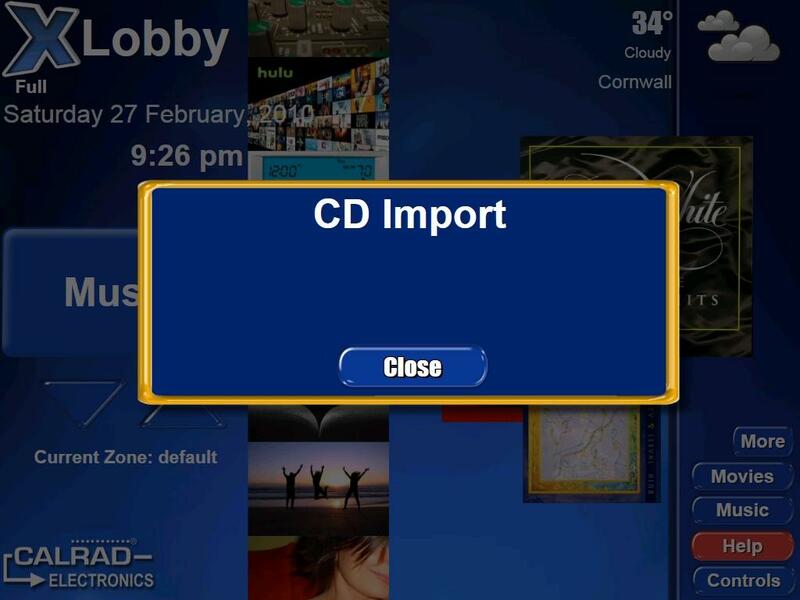 xLobby will auto detect the insertion of a cd with a pop up overlay screen, after closing the overlay the Audio Import Menu will load. 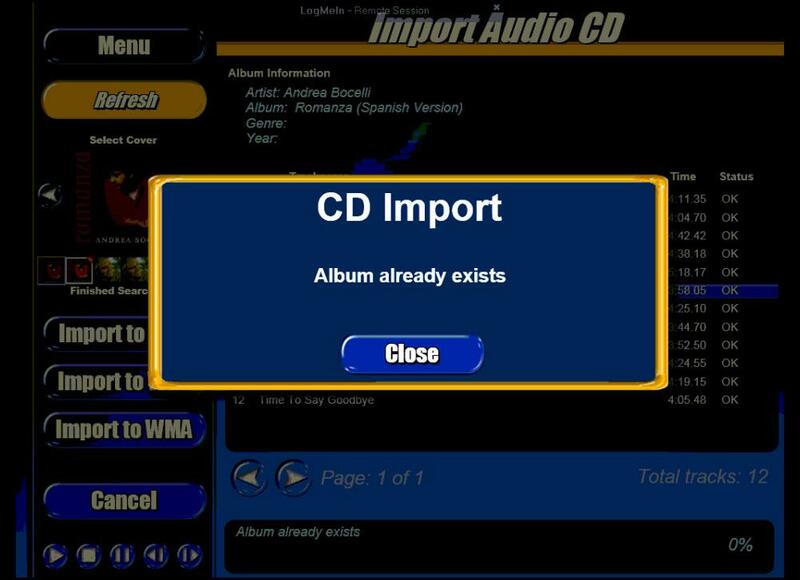 Three choices of audio formats can be selected, rip to .mp3, .wav, .wma. Available screen details are Artist, Album, Genre, Year, Tracks, Total Tracks. xLobby will automatically present the Artist coverartwork and alternative artwork options. The music will be stored into your music folder as specified for the music database in the xLobby setup menu. If a CD title is already in your database, a menu will pop up and let you know. The current version of CDEX is available as a package download in xLobby (Setup) Alt+F2, Updates, Bleeding Edge Update, under Package ID: enter CDEX to download the program. The new storage system is based on a concept that people have tried to do in one way or another on the forum, the use of a custom made category layout. This is the first attempt at doing this in the default skin, new variables and the new group feature allows one to do this, but as we are still working on this feature. I will not go into to much detail as things might change a bit. 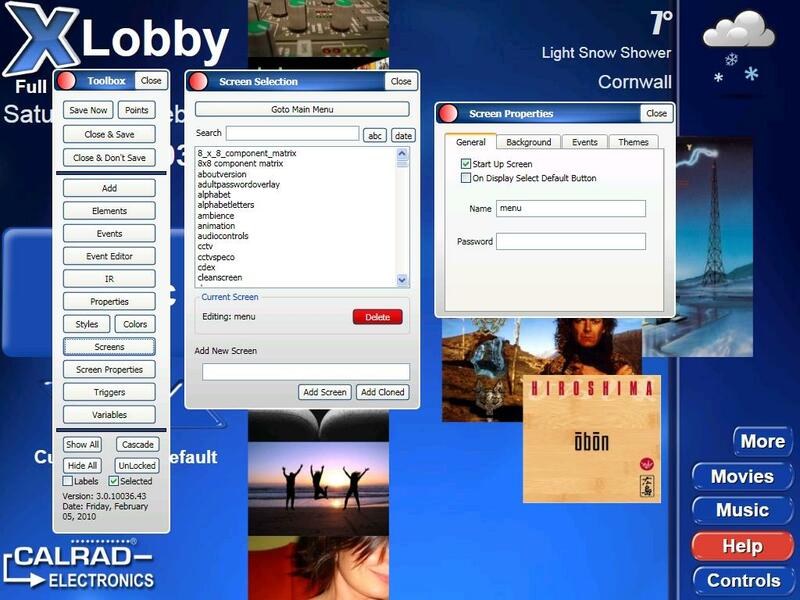 The System menu will continue to expand into an area where users can access information on there xLobby system as well as manage all the details that interact with media and content internally, externally. 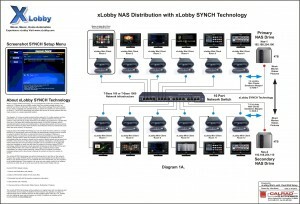 What is xLobby SYNCH technology ? it is a management system the provides several options to 1. Backup all your xLobby content from your primary storage drives to an external hard drive or NAS hard drive system, if the primary storage drives with content fail you have a complete and updated backup to restore the content to a new hard drive or drives, 2. 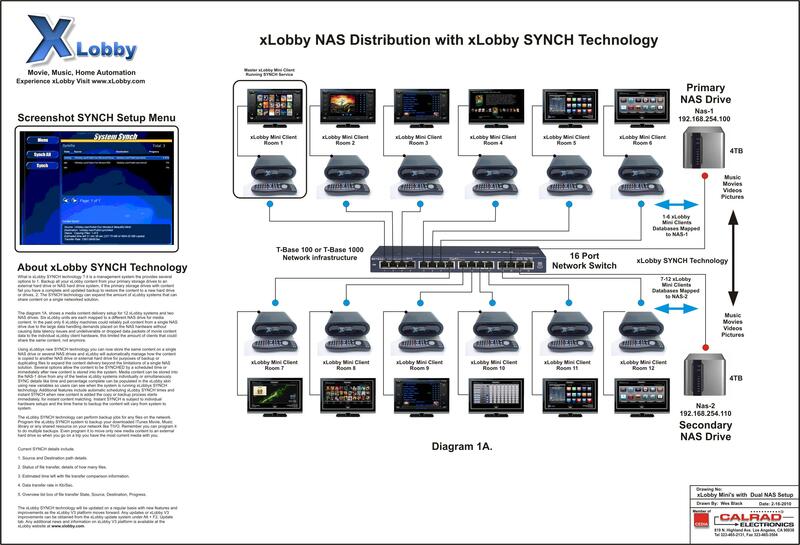 The SYNCH technology can expand the amount of xLobby systems that can share content on a single networked solution. The diagram 1A. 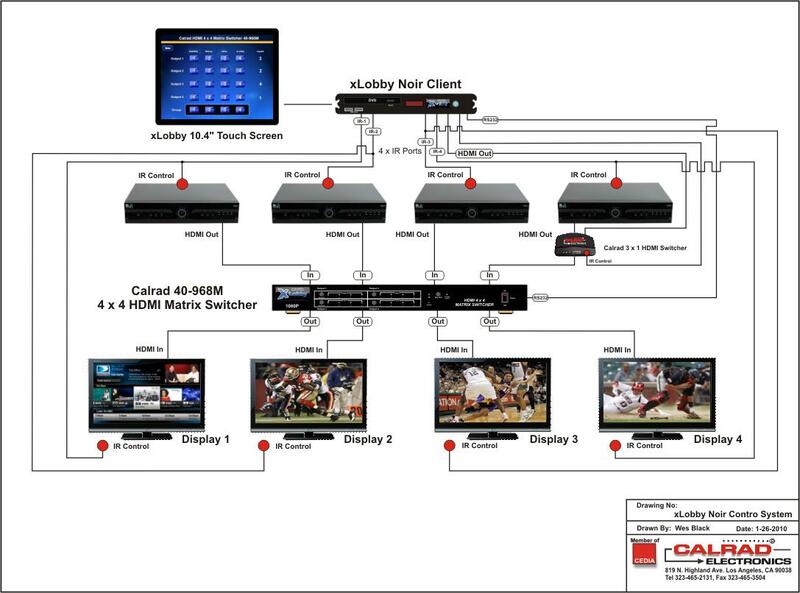 shows a media content delivery setup for 12 xLobby systems and two NAS drives. Six xLobby units are each mapped to a different NAS drive for media content. 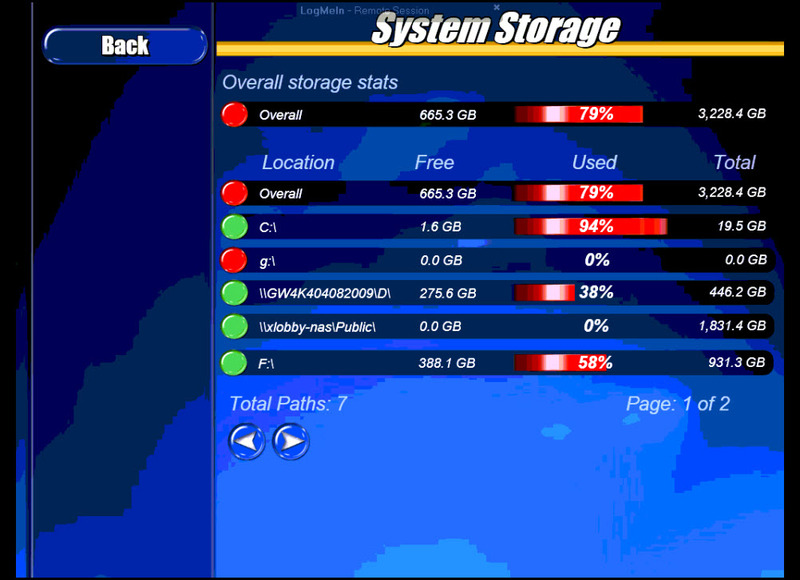 In the past only 6 xLobby machines could reliably pull content from a single NAS drive due to the large data handling demands placed on the NAS hardware without causing data latency issues and undeliverable or dropped data packets of movie content data to the individual xLobby client hardware, this limited the amount of clients that could share the same content, not anymore. Using xLobbys new SYNCH technology you can now store the same content on a single NAS drive or several NAS drives and xLobby will automatically manage how the content is copied to another NAS drive or external hard drive for purposes of backup or duplicating files to expand the content delivery beyond the limitations of a single NAS solution. Several options allow the content to be SYNCHED by a scheduled time or immediately after new content is stored into the system. Media content can be stored into the NAS-1 drive from any of the twelve xLobby systems individually or simultaneously. SYNC details like time and percentage complete can be populated in the xLobby skin using new variables so users can see when the system is running xLobbys SYNCH technology. Additional features include automatic scheduling xLobby SYNCH times and instant SYNCH when new content is added the copy or backup process starts immediately, for instant content matching. Instant SYNCH is subject to individual hardware setups and the time frame to backup the content will vary from system to system. The xLobby SYNCH technology can perform backup jobs for any files on the network. Program the xLobby SYNCH system to backup your downloaded ITunes Movie, Music library or any shared resource on your network like TIVO. Remember you can program it to do multiple backups. Even program it to move only new media content to an external hard drive so when you go on a trip you have the most current media with you. 1. Source and Destination path details. 2. Status of file transfer, details of how many files. 3. Estimated time left with file transfer comparison information. 4. Data transfer rate in Kb/Sec. 5. Overview list box of file transfer State, Name, Source, Destination, Progress. The xLobby SYNCH technology will be updated on a regular basis with new features and improvements as the xLobby V3 platform moves forward. Any updates or xLobby V3 improvements can be obtained from the xLobby update system under Alt + F2, Update tab. Any further news and information on xLobby V3 platform (SYNCH) will be posted on the xLobby website. 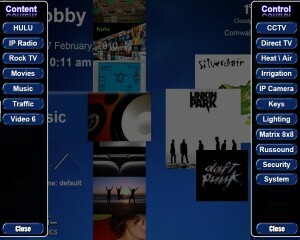 The SYNCH technology features should be available in the next xLobby V3 release. This news post is subject to changes and updates. – 0000331: [installation] XL Will Not Run on Server 2003 Standard (stevenhanna6) – resolved. – 0000787: [generic] 5 min temp writer, keeps local drives awake (stevenhanna6) – resolved. – 0000784: [plugin] dvdcopy timeout error function added (stevenhanna6) – resolved. – 0000783: [plugin] full disc dvd for bluray machines wont copy (stevenhanna6) – resolved. – 0000776: [plugin] XWether Does not display “State” or Country” – only displays “City” now. (stevenhanna6) – resolved. – 0000750: [content playback] current zone audio volume control, like master volume but for the current audio zone (stevenhanna6) – resolved. – 0000796: [services] russound new commands, “current state” “save” and “restore” (stevenhanna6) – resolved. – 0000795: [generic] new commands “os->email enable”, “os->email disable”, new variable %xlobby>emailenabled% (stevenhanna6) – resolved. – 0000794: [skin editor] “alphabetize”: Toolbox/Styles/”Font Resources” (stevenhanna6) – resolved. – 0000793: [triggers] new “Http Post” trigger added (stevenhanna6) – resolved. 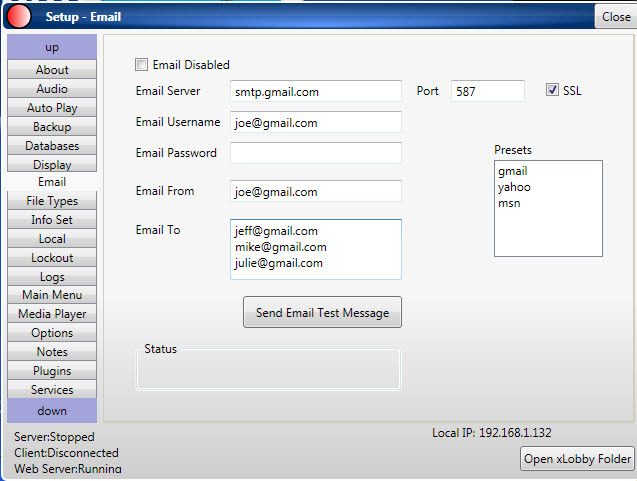 – 0000792: [setup] “email” area added under setup to configure outgoing mail server (stevenhanna6) – resolved. – 0000791: [generic] new “os->email send” command added (stevenhanna6) – resolved. – 0000788: [generic] Covers won’t update with “F2 DB Editor”, but will with “spider save events”. (stevenhanna6) – resolved. – 0000107: [generic] screens sort by last edited date (stevenhanna6) – resolved. – 0000786: [skin editor] scroll bar missing on style manager (stevenhanna6) – resolved. – 0000785: [generic] when joining playlists the playlist name is changed to the last add playlist (stevenhanna6) – resolved. – 0000797: [generic] allow mantis users the ability to collaborate on existing user manual (top of mantis page) (stevenhanna6) – resolved. The xLobby V3 Manual is finally taking shape and is accessable from the mantis section of the xLobby website, we are using Google docs to provide colaboration of the file. We have decided to open access to the file for those users that have access to Mantis you have supported the xLobby platform for so long, your help and contributions are very much appreciated. If you participate in the User Manual, please add your name to the list of User Manual Contributors at the top area of the google docs page so we can keep track of everyone who edits the document. 1. 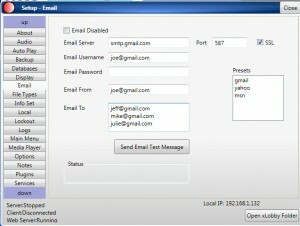 Under Alt+F2, there is a new tab labeled E-Mail for setting up the xLobby E-Mail profiles for connecting to E-Mail servers and accounts like Yahoo, MSN, Gmail, etc. .
2. E-Mail event under Event Editor, Command Group\Commands (Email send), Subject + Body information to be sent to the E-Mail server, located under Alt+F2 in xLobbys setup menu. 3. 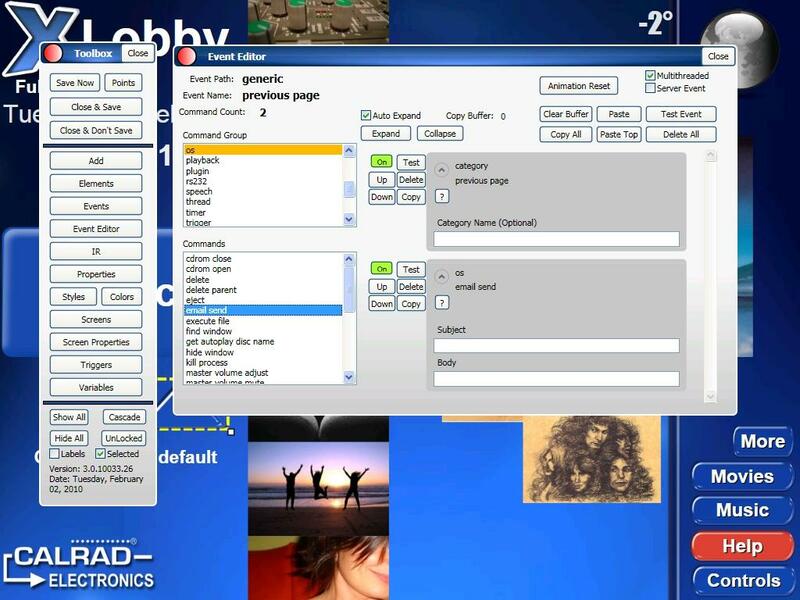 A new HTTP Port Trigger for receiving commands from IP based devices like the WACI, Global Cache, Etc. .
xLobby Screenshot of the Screen Selection menu. A new feature was added so you can sort screens alphabetically (abc) or by (date) the edit date. This News post is subject to change. 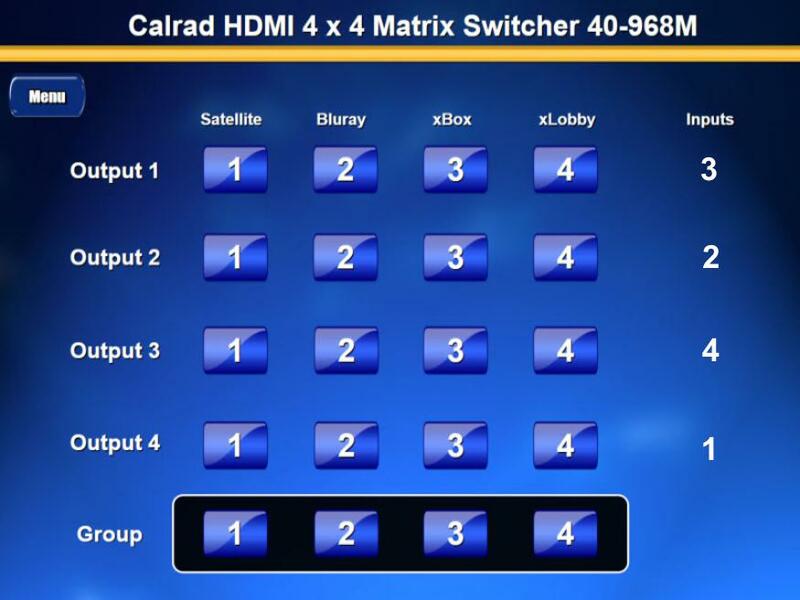 Calrads new 4 x 4 HDMI matrix switcher can be used for multi-room or multi-display signal delivery, IR or RS232 controllable. 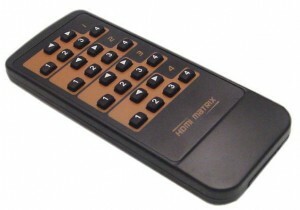 The interface can be used with a touchscreen or IR style remote using IR commands to xLobby or via RS232 for one way or two way communication using RS232 protocol type remote controls. 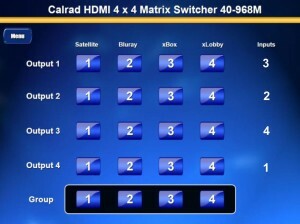 The (Group) commands provide a single event to switch all outputs to sources 1-4.
xLobby screenshot of the xController service running RS232 communication with Calrads 40-968M 4 x 4 HDMI matrix switcher. -Maximum transmission distance: without signal loss with transmission distance of 10m by 26AWG hdmi cable and 15m by 24AWG hdmi cable and more 22 AWG hdmi cable. Drawing Illustration of a xLobby controlled Satellite switching system used in a sports bar. 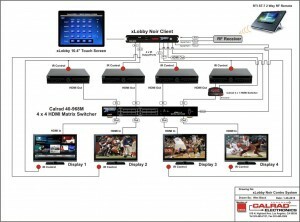 The system can also be used in a home to route 4 video sources (Satellite, Blu-ray, xBox, xLobby) to 4 displays. xLobby can directly control the HDMI matrix switcher by itself or any type of universal remote such as RTI, etc. 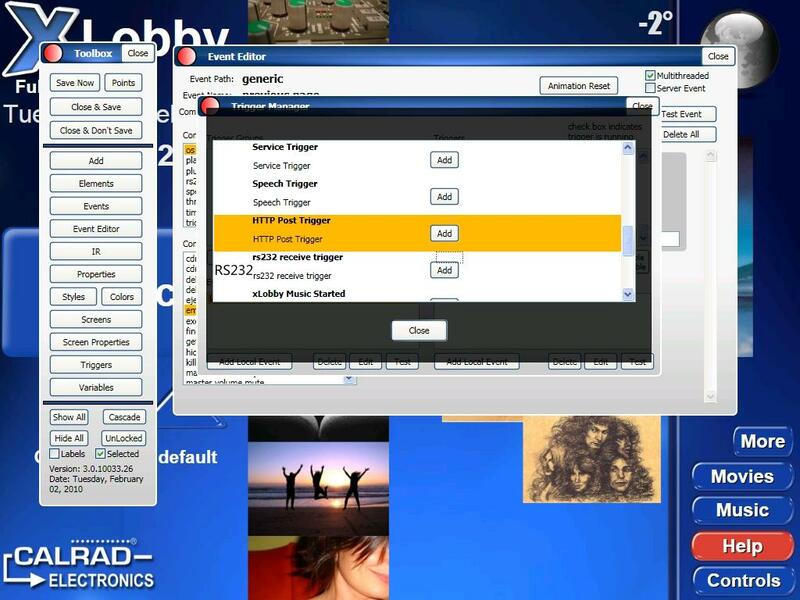 can be setup to speak with xLobby using a second RS232 port for full 2 way communication as well, so that touchscreens and wireless remotes have full 2 way control to the switcher independently or simultaneously. This news post is subject to changes or updates. 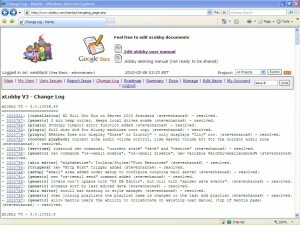 You are currently browsing the xlobby news blog archives for February, 2010.